Critically acclaimed smash hit starring Academy Award® winner Mel Gibson (Best Director, 1995, Braveheart) and directed by Academy Award winner Ron Howard (Best Director, 2001, A Beautiful Mind) – on Blu-ray for the first time with an incredible new digital restoration! Tom Mullen (Gibson) is a wealthy executive whose life is suddenly shattered when a gang of ruthless criminals abducts his young son and holds him for ransom. But it’s the kidnappers who are shocked when Mullen boldly turns the tables in a last-ditch effort to rescue his boy. Rene Russo (Thor) and Gary Sinise (Forrest Gump) join an excellent cast in a brilliant thriller that pays off with non-stop excitement! Ransom images are © Touchstone Pictures. All Rights Reserved. The name Mel Gibson used to bring a smile to everyone's face, but that quickly changed and now one can't help but cringe at the mere mention of him. A perfectly reasonable reaction in light of the star's recent behavior. However, this review isn't about the man, but about his work, which can't be argued with. Gibson is a fine actor with a history of iconic roles and emotionally charged performances. One of his most challenging and possibly difficult roles is 1996's "Ransom," where he teamed with director Ron Howard. The pairing certainly threw some for a loop, turning a twisted tale of a cold-blooded kidnapping into a gripping mainstream diversion. Coming off an incredible year of big screen achievements (1995 saw the release of Gibson's "Braveheart" and Howard's "Apollo 13"), the duo then followed those juggernauts with the more subdued "Ransom." While overly long, the film offers a large amount of suspense, all brought boiling to the surface by Gibson, who keeps the picture on point. An airline owner who's crossed into shady territory with unlawful union dealings to keep his business afloat, Tom Mullen (Mel Gibson) finds solace in the love of wife Kate (Rene Russo) and son Sean (Brawley Nolte). When Sean is kidnapped during a Central Park science fair, Tom and Kate are flung into a full-blown panic, having no idea where to look or any leads to follow, this soon attracts the attention of the F.B.I. and Agent Hawkins (Delroy Lindo). Receiving word that a significant ransom must be paid to retrieve Sean, Tom is more than willing to cough up the cash, putting faith in the cruel exchange. However, the crooks decide to punish their mark on the way to financial reward, and so Tom changes the deal, using the ransom money to put a hit on the kidnappers. Realizing his devious plan of abduction isn't coming together as planned, crooked cop Jimmy (Gary Sinise) increases his demands, threatening to kill Sean while his grungy, alcoholic underlings (Lili Taylor, Liev Schreiber, Donnie Wahlberg, and Evan Handler) begin to crack under the intense media pressure, forcing the mastermind to engage in desperate measures to insure his dastardly payoff. While flirting with the darkness in features like "Backdraft", "Ransom" introduced a maturity to Howard's directorial career, burrowing into a bleak tale of loss and improvised revenge. At no point do we ever feel a sense of hope, instead each scene is stretched out to near breaking, intensifying the emotion between the characters. The emotions practically come off the screen, making the viewer almost squirm with unease as each moment slowly brings you the stylized conclusion. The only few troubling spots along the way are mainly with Jimmy. The story doesn't seem to complicate the villain's balance between his duty as a cop and his unashamed greed, instead displaying his true nature as the film's antagonist without much delay. Sinise goes along for the ride, offering a one-dimensional performance, never capturing a duality of responsibility that could elevate Jimmy from a colorless scumbag to a truly combative foe. The script provides you with Jimmy's bitter recollection of the deceptive class hierarchy found in "The Time Machine," but that is as far as his motivations go. The flow of the film seems to peak early, sucking you in early on with Sean's kidnapping, then Tom's reversal of ransom demands, but towards the end finalizes in a car chase more reminiscent of The Fast and the Furious. 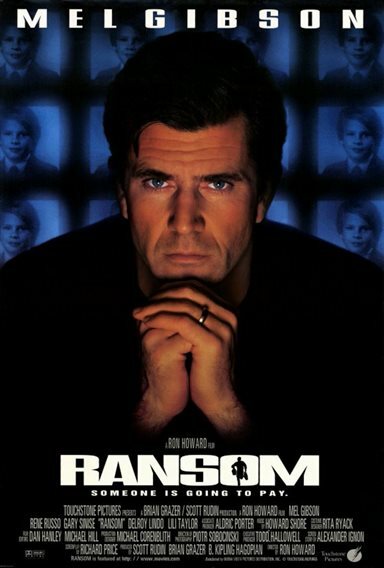 In the end, Gibson delivers this movie to its finish, purging his emotion for all the world to see, giving "Ransom" a satisfying sense of discomfort. On Blu-ray, you will rarely find a better film to watch as the format enhances his performance to another level. Though if you're something of a fan of this film, don't get your hopes up, no bonus features are added here. 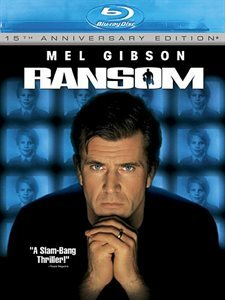 It's hard to imagine what "Ransom" would've been like had Gibson not graced it with his confidence and emotional nuance.